Chop the onion and crush the garlic, fry with the olive oil in a large saucepan, until golden. Wash the lentils and add to the saucepan. Fry gently for about one minute. Stir in the water and tomato puree, the herbs and the seasoning. Bring to the boil for five minutes. Simmer for approximately until the lentils are soft (or to your taste). 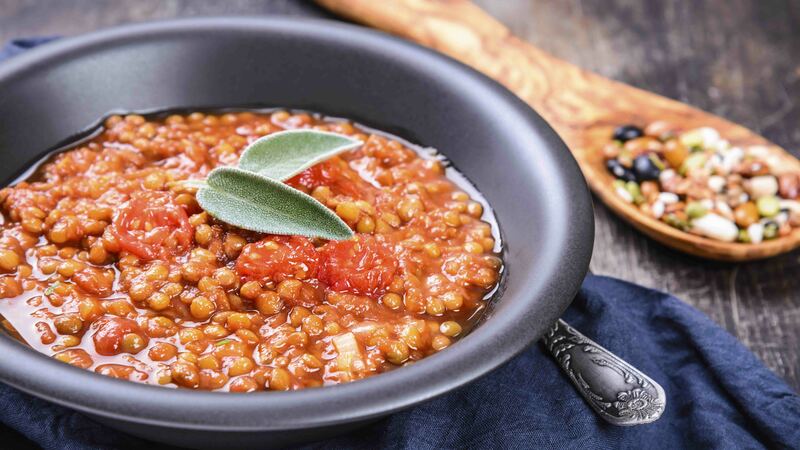 Add more water, or a drop of white wine, if the lentils are drying out before being cooked. This dish can be cooked in the wood burning oven whilst it is at a low heat perhaps whilst the oven is warming up, or cooling down. It is best served with crusty fresh bread, preferably cooked in the oven.